Control System Toolbox™ software offers several tools and commands for tuning PID controllers. To select the best tool for your application, see Choosing a PID Controller Design Tool. For information about tuning PID controllers in Simulink® models, see Model-Based PID Controller Tuning (Simulink Control Design). Tune a PID Controller to meet rise-time and settling-time requirements. PID Tuner provides system response plots and other tools for tuning PID controllers. 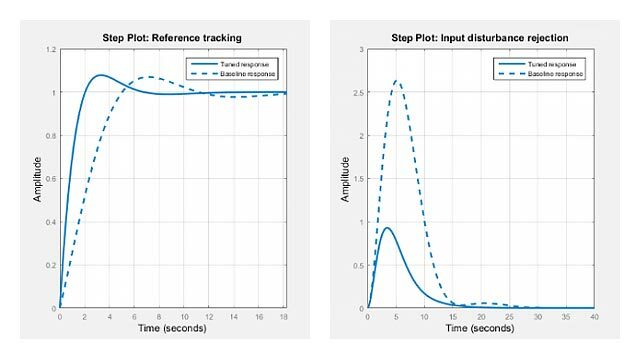 PID tuning is a tradeoff between reference-tracking and disturbance-rejection performance. This example shows how to tune to favor one or the other when using PID Tuner. Design a two-degree-of-freedom (2-DOF) PID controller, and compare the controller performance with that of a 1-DOF PID controller. If you have System Identification Toolbox™ software, you can use PID Tuner to estimate a linear plant model based on response data measured from your system. PID Tuner then tunes a PID controller for the resulting model. Programmatically tune a PID controller using the pidtune command. Use the tuning options of the pidtune command to favor reference tracking or disturbance rejection at the command line. This example shows how to design a PI controller with good disturbance rejection performance using the PID Tuner tool. Design two PI controllers for a cascade control system using the pidtune command. You can tune the gains of PID Controller blocks to achieve a robust design with the desired response time using PID Tuner. This example shows how to tune a PID controller for plants that cannot be linearized. When your plant cannot be linearized, you can estimate a plant model using frequency response estimation and import the plant model into PID Tuner. Control System Toolbox software provides several tools for designing PID controllers. PID Tuner lets you perform automatic, interactive tuning of PID controllers. Using the PID Tuner app and the pidtune command, you can tune many PID and 2-DOF PID controller types. MathWorks® algorithm for tuning PID controllers tunes the PID gains to achieve a good balance between performance and robustness. System identification is the process of estimating a dynamic representation of the system you want to control, based on the system response to a known excitation. Identification of a plant model for PID tuning requires a single-input, single-output data set. In PID Tuner you can represent identified plant dynamics as either process models or state-space models. Perform preprocessing operations such as removing offsets and filtering the data before you use it.